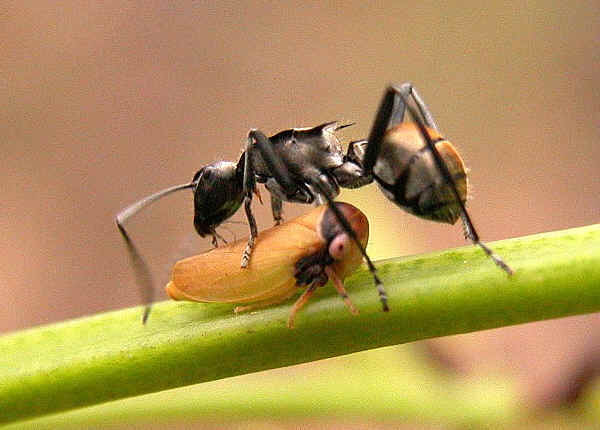 Some reference books suggested that the ants come for the honey dew produced by the special secretary organs on their body. 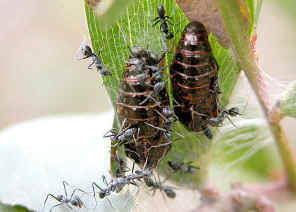 However, we noticed that the ants also attended the pupa, which were not likely to produce any honey dew. The Caterpillars always attended by a few Iridomyrmex species of ants from the subfamily DOLICHODERINAE and not by other species of ants. 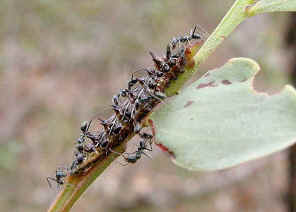 We suspected that the caterpillar and pupa may exploit and take the advantage the chemical signals of those ants. The caterpillar and pupa may secrete the chemical so that the ants think they are their 'Queen' or 'sisters'. This is just and speculation, need more observations on this. Last updated: November 06, 2006.